Designed for Tractor, Skidder and Grader Tire Repair. Handles Radial and Bias Ply tire sizes from 14.00 x 25/25 through 18.00 x 24/25. Handles up to 20″ x 20″ (51 cm x 51 cm) patch – distortion free. The Vulcanizer repair process allows the rubber to flow during curing in both the plug area and between the patch and inner lining of the casing to form a dense, sealed repair that will not leak or fail. Built-in Automatic Air Differential Control supplies approx. 45 psi of pressure to the inside and approx. 30 psi to the outside Airbag of the tire to cure the plug and patch simultaneously. Outside Heatpad conforms to tire profile. Lightweight self-standing design offers portability and maximum stability. Low profile, easy access 27″ (69 cm.) 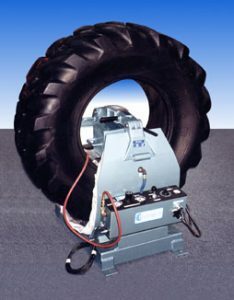 Expandable High Tensile Steel Shell Cavity simplifies tire loading and unloading. Quick Lock device is easy to operate – no time-consuming tensioning straps required. Available in electric or steam configuration for cost and energy efficient operation. 400 cure hours or 6 months warranty on parts, Heatpads and Airbags. Total pressure of 18,000 lbs. is applied to maximum patch size to produce a dense, long lasting compression cure that will outlast any open steam cure. This new generation of Vulcan-Vulcap Section Repair Molds are light-weight and cost-effective. If proper repair procedures are followed, repaired injuries can be guaranteed for the life of the tire. The repair is a true vulcanising repair, where the rubber flows during curing both in the plug area and between the patch and inner casing liner. This is not the case with chemical pre-cured patch repairs. All Vulcan-Vulcap models of Section Repair Molds are patented and are the result of over 50 years of successful research and development for the independent tire repair and tire retread industry.